This nine-week whole-church resource will help members see both the priority of evangelism for our churches, and to see the role that everyone can play in reaching out to those who are lost without Christ. The Leader's Guide contains everything you need to lead this flexible course. Many Christians are nervous about telling someone else about Jesus. We prefer to leave it up to the preacher, or to those we see as particularly gifted for evangelism in our congregations. But all believers are called to make disciples. The nine sessions in this curriculum don't offer quick fixes or evangelism "gimmicks". But by continually pointing us back to the gospel, they will give us the proper motivation to work together as a church to share the gospel message with those who are lost without Christ. 4. Who are we reaching? 5. What is the Gospel plan? 6. How should we pray? 7. What do we say? 8. How do we speak? 9. How do we keep going? Cultivating an evangelistic, missionary, gospel-focused community does not happen by accident. It requires intentionality. 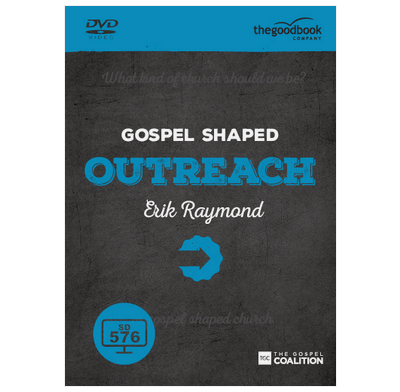 Gospel Shaped Outreach is an excellent tool that can help a church accomplish this God glorifying goal. I am delighted to commend its widest possible use. Work through it and then go and do what it teaches. President, Southeastern Baptist Theological Seminary, NC. Church is for Christians to assemble, worship, get fed and equipped to “go and make disciples.” For too many years our churches have taken the easy road by inviting the lost to church and calling it “evangelism.” This well intentioned trend of inviting the tares into the church in hopes they will become wheat has to stop. Is it doable? Absolutely. And “Gospel Shaped Church” will help. Erik Raymond does a masterful job of motivating the church to become Gospel-centered evangelists by utilizing the very thing he promotes: the Gospel. “The Gospel Shaped Church” is not a movement, it is Biblical. If you have been looking for a tool to equip your flock to become soul-winners, look no further.